The Eye Opener, as the name states, is meant to get you back on your feet in the morning. Like many drinks with eggs in them, this is meant as a hangover drink. The yolk is meant to help coat your tummy, and of course the liquor is for your classic hair of the dog. The Lommebogen recipe is unlike any others I’ve seen. It is quite different from the Savoy and Café Royal books, as well as the modern version, most notably due to using cognac instead of rum, and adding lemon juice. I couldn’t find any trails that could show me why the Lommebogen recipe is so different. It just seems to be an outlier that Axel picked up, off from the classic recipe. In the Savoy/Café Royal recipe one of the sweetening liqueurs is Crème de Noyaux. I had to sort out what that was and if I was going to track it down to add to my bar. It’s an almond-flavored liqueur made from apricot pits, and it has a bright red color. Apparently this is generally similar to amaretto except for the color and being a bit sweeter. You can read more about Crème de Noyaux over on the Cold Glass blog, along with another recipe that uses it, the Fairbank. For my purposes I just went ahead with using amaretto. I didn’t feel like tracking down a whole bottle for two dashes. Tip: I’ve written about using eggs in cocktails before. If you are using egg yolks, in particular, you really need to double strain. (That is, don’t rely on just your cocktail strainer, but pour it through a small sieve as well.) The ookey string that attaches to the yolk (the chalaza) is a nasty thing to sip in your drink. Double strain that thing out of there. The Lommebogen recipe is just yuck. Completely unbalanced. Perhaps if the lemon and sugar were upped, or something. I dunno, I can’t even figure out how to fix it from the taste. I ended up dumping it out. The Savoy/Café Royal was better, but still not hitting it for me. It’s like it wanted to be egg nog, but just really wasn’t. 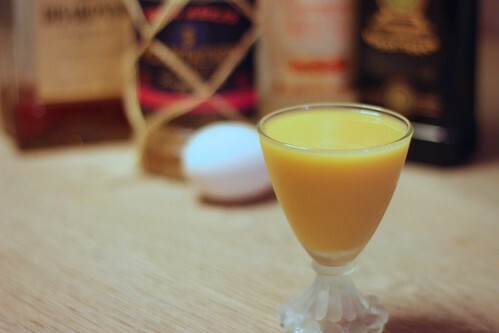 I didn’t feel that the egg yolk was balancing out the liquor without more sugar, I think. I did prefer the rum version, mostly because it tasted a little sweeter, with the rum and liqueurs there. More modern versions of the recipe cut the rum a little and have a tiny bit more of the liqueurs in there. I think that would turn this into a palatable drink. I love a fair number of flips (which use a whole egg in them) and I’d steer towards one of those before coming back to this one. Previous postAre My Values Really My Values?